Awhile back I purchased several herbs with the intention of making a healing salve. The process is rather involved and the first step is to let the herbs steep in olive oil to draw out their healing properties. I finally carved out the time last week to get the process started and now I have little jars of herbs and oil sitting in my window. I will update you with how the salve turns out in a later post. The salve recipe calls for St. Johns Wort and as I busied myself preparing the salve, I realized I knew very little about this herb. I thought a little research would be interesting and this is what I found. St. John's Wort is beautiful yellow-flowering perennial also known as Hypericum Perforatum, Tipton's weed, or Klamath weed. It's name comes from it's traditional flowering and harvesting on St. John's Day or June 24th. It was traditionally used to ward off evil by hanging the flowers over a religious icon in the house on St. John's Day. The most common use of St. John's Wort is as an herbal treatment for depression. 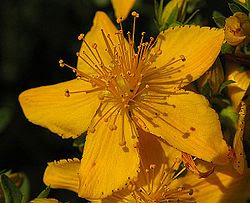 In fact, the Cochrane Review, a key resource in evidence-based medicine, "the available evidence suggests that the hypericum extracts tested in the included trials are superior to placebo in patients with major depression; are similarly effective as standard antidepressants; and have fewer side effects than standard antidepressants." Hmmm...interesting. This herb has some anti-bacterial properties especially against gram negative bacteria. When used externally - like the healing salve I'm preparing - it acts as an anti-inflammatory, astringent and antiseptic. Native Americans used strong doses of this tea as an abortifacient so do not use this herb during pregnancy. This herb can be taken in capsule form. Drinking a tea or standard decoction of this herb can be very soothing. Also interesting, there is a homeopathic made from St. John's wort. It's called Hypericum perfoliatum. It's great for healing and soothing nerve pain such as from crushing injuries; tailbone injuries; injuries to nerve-rich areas like the fingertips, toes, spine, palms or soles; and burns. This is a great herb to support and heal your nervous system! Mountain Rose Herbs sells this great herb in leaf or capsule form.